Ponty Bistro Harlem | HarlemGal Inc.
Time flies when your making delicious food in Harlem! Ponty Bistro, the Harlem restaurant, helmed by Chef Cisse—a 2009 finalist in the hit Food Network show “Chopped,” turns two this month. 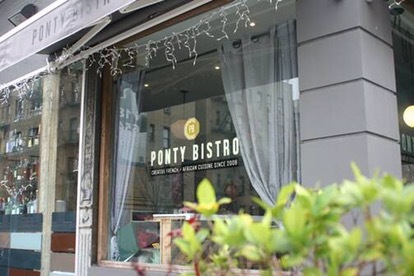 Stop by Pontry Bistro Harlem located just off Strivers’ Row at 2375 Adam Clayton Powell Boulevard at 139th Street and wish them Happy Birthday! While you’re there try some of their signature dishes: Crispy Tuna, Fish Fataya, Truffle Macaroni and Cheese, Le Poulet Yassa, Niokolokoba and Poisson Braise A Le Guet Ndar. Brunch on weekends offers Lobster Benedict, French Toast, Scrambled Bruchetta, and much more. Happy Birthday Ponty Bistro! And continued success in Harlem!